Netflix is one of the best video streaming services which offer the best content on the internet. However, Netflix also restricts content for many countries as per their contract with producers. Netflix’s system tracks users based on their IP, so even if you a US-based account, it will block content if your current location is different. That’s where you need PrivateVPN. It is specifically built to unblock Netflix in different regions and let users access all the contents even if you have a physical place outside the US. PrivateVPN offers a custom-built VPN for Netflix. It gives you access to full US catalog of movies and TV shows. You can choose to stream in HD, and also access using multiple accounts. Apart from the US, you can also select any other countries IP, and access content which is available only for that region. PrivateVPN offers IP bought directly from transit providers. It uses High-quality-network (HQN) servers to make sure the speed is not a problem. It also makes sure that your account remains safe. The most significant advantage of using PrivateVPN is that they have working servers for every country. It makes things a lot easier. Once you buy the subscription service, download the software for windows or if you are using it on your phone, download the app and sign-in with the account credentials you created while buying it. The next step is to configure server which is dedicated for Netflix. Click on the dropdown, and select a server which has a mention of Netflix. Once you select click on connect, and it will connect to the US server, and also reveal the IP address. Post this, you can open Netflix on the browser or the app, and it will show the content available for the US only. You can instantly start streaming those restricted videos. I tried this, and it works. The screenshot above reveals Flash in the search which is limited to the US region only. The account I am using here is not from the US. My experience of using PrivateVPN is fantastic. All one needs to is install the software, select the region, and click connect. Your access to US restricted Netflix videos is going to be instant. You don’t need to do any change in your account. 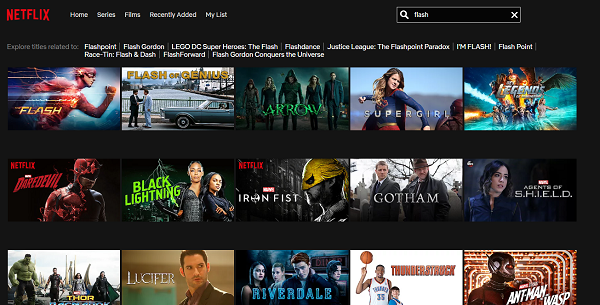 When you log in with your account, Netflix will show all the content which never were on your account before. As of now, US Netflix broadcasts over 5400 of the latest movies and TV series. Using PrivateVPN, you can get access to all of them. While it makes sense for companies to restrict as they pay only for those countries, PrivateVPN removes that block for consumers. In case Netflix figures out a server, it is replaced instantly by another. It makes sure that you can keep going and make money worth you paid for the VPN. If you are using it from China, make sure to use L2TP. The firewall of China blocks OpenVPN and, in some cases, PPTP. If you are not able to connect correctly, make sure to reinstall Windows TAP adapter. You can do so from Advanced Mode > Settings > Install/Repair Windows TAP adapter. Reconnect automatically on connection failure. Connect automatically at the startup. Connection guard offers IPv6, DNS leak protection. Kil Switch which makes sure you don’t connect with the regular internet on your computer when VPN fails. It makes sure your privacy is intact. You can choose to kill programs by Application Guard when it disconnects. 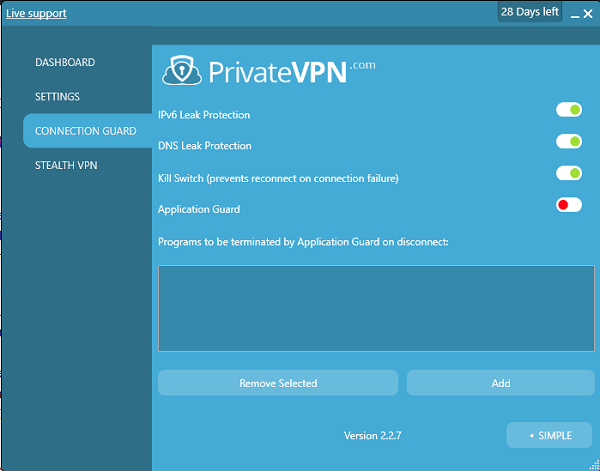 Stealth VPN offers to bypass the most secure VPN blocks and DPI firewalls. However, this may slow down your network. 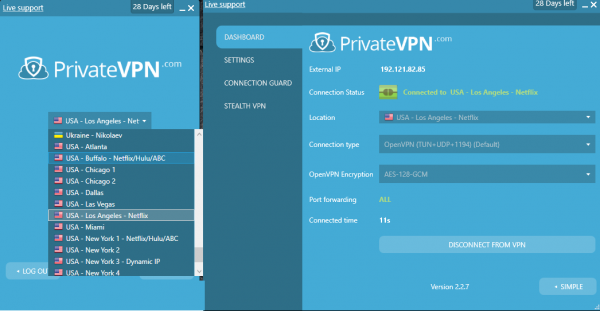 While you can use OpenVPN, you need to select before connecting to VPN servers. It is also advisable to choose the Open VPN encryption to 256. The default is 128 bit. You can buy PrivateVPN from its homepage. It comes with the full 30-day money-back guarantee and support. It is also available for Mac, iOS, Android, Linux, and Routers. Since you can use it in parallel on six different devices, it makes it cost effective, and easy to unblock Netflix in different regions. The company also offers a week of the trial to evaluate the service. You can connect with them over support@privatevpn.com to receive a gift code. Your trial time starts as soon as you register your account.